James Van Der Beek In Strong Suit – Watch What Happens Live! 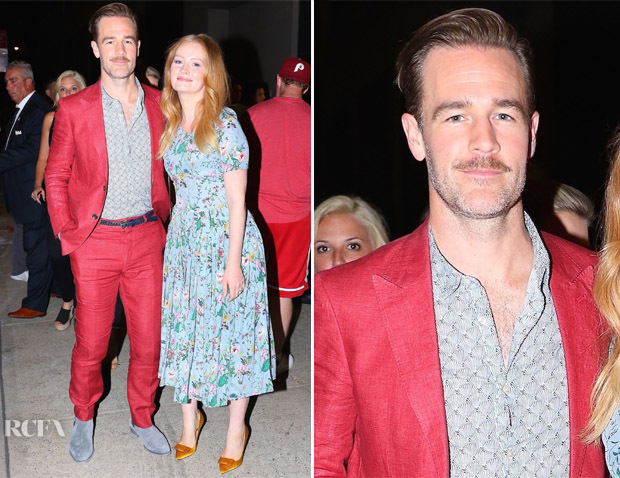 James Van Der Beek and his wife Kimberly Brook looked smitten after his ‘Watch What Happens Live’ interview in New York City on Tuesday (August 1). After a summer of “playing it safe” by the fellas, I was delighted to see James opt for this light-weight suit from Strong Suit. Not only for the bold red hue, but for going one step further with the floral shirt and accessories. It may be too far left for some, but my only issue here is the pornstache. Kimberly’s delightful summer frock was firmly in safe aisle, however, I love how she matched her velvet pumps to her flame-coloured hair.